Click a rider to make a donation! Paul Armstrong was the very first employee of Stage Electrics and is still with the company some 38 years on. During this time, he has held most positions for the company from driver through to transport manager and from customer service representative through to branch manager. This year marks his 40th year in the industry and he had already decided to do the First Night Ride to mark it. Paul will be riding his BMW and is delighted to be joining the other riders and hoping to raise lots of money for the cause. This will be their third year to participate in the FNR. John is a Chartered Accountant and assists in the preparation of TTG statutory accounts. Robert’s ambition is to be a commercial airline pilot and has almost completed flight school. At present Robert is a coach for archery at the same time restoring a Mini Clubman. He is also the pilot of the motorcycle we are using. Geoff has been riding bikes for a couple of years more than he has been working in theatre. Geoff joined the First Night Ride in 2016 after intending to do it since he first heard of it five years before. He enjoyed it so much that he decided to do it again this year! George is a theatre consultant who specialises in designing stage machinery systems. His pillion passenger will be his daughter Ruth. George began his theatrical career backstage at the Crucible Theatre in Sheffield, followed by a spell at the National Theatre where he learned all about putting on shows with power flying systems. He then got mixed up in building new theatres and concert halls around the world with Theatre Projects Consultants. He currently works as a designer on a variety of Arts and Entertainment projects for the international building engineering and consulting company Arup. Mr. Hamilton has participated in 8 Long Reach Long Rides in the US and this will be his 6th in the UK as a chase car driver in support of the bikes (aka baggage handler). It is an honour to to be part of the First Night Riders once again and I hope we can smash all records for fundraising for the Theatrical Guild this year. You can help! Don't just read my bio and laugh at my photo, make a donation and let's make this year one the best! Mr. Hamilton is a theatre design consultant from Vancouver and is co-owner of DWD Theatre Design + Consulting: "Creating Spaces That Perform". Wes has been involved in the entertainment industry for over 30 years. This has taken him across Canada, into the United States and through China. As co-owner of Down Stage Right Industries, he has installed rigging systems in throughout Western Canada and completed rigging inspections coast to coast. He is presently the Director of Facilities Operations at The EPCOR Centre for the Performing Arts in Calgary, Alberta, Canada. He is a world traveller and an accomplished chef. Mick and Jenny Powell will hopefully not need to use their skills in Neuro Surgery and General Practice. They will be on Mick's Moto Guzzi. This will be our sixth time with the First Night Riders, last year was great so we are looking forward to this year’s ride. We live in Sweden and as my wife Marie refuses “to drive on the wrong side of the road”; she will leave her bike at home and come with me on the Triumph Thunderbird Storm. I run a company called Anderson & Co Sweden AB and we make the machinery and supply all the lighting for the entertainment business. Marie works in the company as well, she takes care of the fabrics and she is also a hatter, so Anderson & Co is a little special since the same company is welding, building electrical cabinets as well as making high hats. This is my third FNR and this year I have returned from Aus to participate. Having come from a family of motorcyclists it certainly is in my blood. Now back in Aus , I have upgraded to a Harley Davidson switchback, which I LOVE riding.. I have to say the roads and weather of Australia , make a Sunday ride slightly different to that of the UK. In August I shall be taking a small 5000 km ride around the US to visit the worlds largets bike rally Sturgis and a visit to the HD 115th birthday celebration.. I look forward to meeting my FNR friends again and making new ones too.. Thanks for visiting my page. Through Virgin Money Giving, you can sponsor me and donations will be quickly processed and passed to the TTG. Virgin Money Giving is a not for profit organisation and will claim gift aid on a charity's behalf where the donor is eligible for this. We really appreciate all your support and thank you for any donations. This will be Lucy's second official year on the First Night Ride however she has been involved on the sidelines for all of them, helping with the planning as and when required. She is very pleased to be riding something bigger than a 125cc this year. She has worked in theatre since 2010, when she started the TTSM course at RADA, has worked freelance in theatre and film in the UK and Canada; she is now working at Triple E Ltd.
After 30 years in technical theatre and having gone from Stratford East to South East Asia, now I run my own consultancy practice advising on arts and capital projects. This is my sixth First Night Ride and it would be great to set a personal best with regard to fundraising so please dig deep for the cause. I have been involved in theatre engineering since I was a teenager. My company, Inventive Creative Ltd, provides design and stress analysis services for mechanical and structural scenic elements and theatre equipment. This will be my fifth ride and I’ve loved every one. Looking forward to meeting up with friends and exploring more of our fabulous country, and all for a great cause. This is my sixth year with the fun-loving bikers - those extraordinary First Night Riders. Bound to include a few roads, some byways, the odd motorway, quite a number of theatres, and lots of silliness along the way, raising funds for The Theatrical Guild - so do give generously! Nick and Animal (Richard) have both worked at the forefront of the installation sector of the industry for over 30 years. Animal has always said he would do the First Night Ride before he turned 50 and having now reached the tender age of 49 he has joined the other riders just in time! Animal and Nick have worked together for over a quarter of a century but this will be the first time Nick has ridden pillion on a motorbike driven by Animal and he can think of nowhere better to do it. They will be on Animal’s Harley Davison VRSCAW V Rod and are both hoping to raise lots of money for the cause. David Edelstein is the founder and M.D. of Triple E Ltd and a petrol head from the age of 4. Back in 2005 I joined Bill Sapsis on the 2nd Long Reach Long Riders event, It was great fun and raised money as well, in 2006 I repeated the experience but also took my 10 year old son Henry on the pillion and we rode from Philadelphia to Los Angeles. 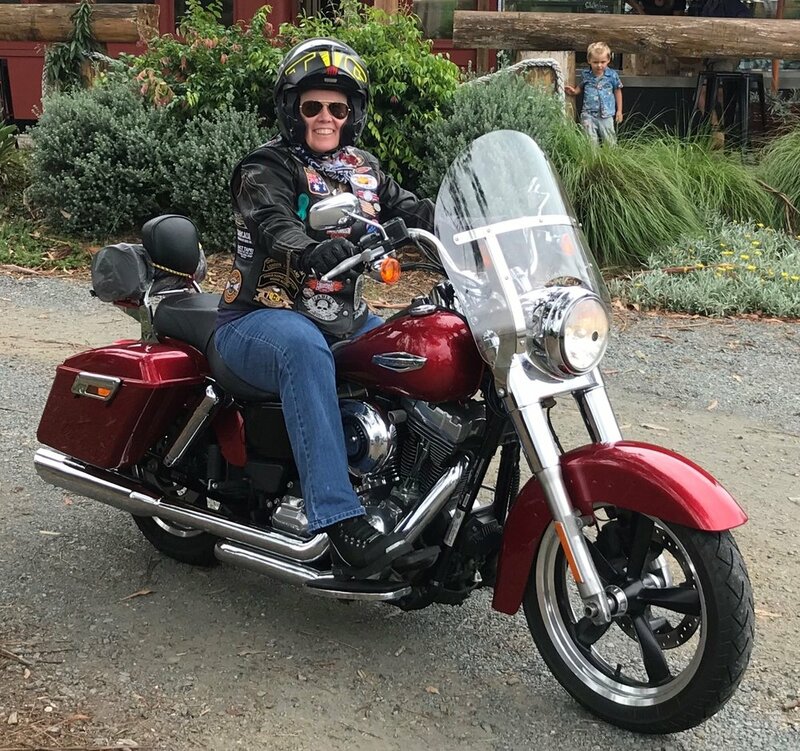 I took part in two more American rides with my daughter Lucy and also with my wife Brenda who has also ridden pillion and driven a chase car. In 2009 Brenda and I were introduced to the TTG and since 2010 we have organised the First Night Riders events which tour UK theatres raising awareness of the TTG and the work it does to support backstage and FOH personnel in times of hardship. Each year we plan a different route and visit a new set of theatres. 2018 will be the eighth FNR event and our 1000 mile route will start in Chester and then be based in Pitlochry from where we will tour the Scottish highlands. We hope that this will be a record breaking fund raising year for the TTG. Join the fun in aid of a great charity. I have Stage Managed in London, the UK & mainland Europe and also spent 10 years with the BBC working in many aspects of production. Steve joined Charcoalblue in 2016 and is Studio Principal in their newly established Glasgow Studio. Steve has worked in technical theatre for over 30 years. Initially as a carpenter, (he still has all his fingers…) then production manager. From 1999 to 2012 he was Scottish Opera’s Technical and Operations Director. In 2012 Steve returned to studies and completed an MSc in Architecture and Advance Environmental Energy Systems at CAT in Wales. His Thesis subject was computer simulation of Victorian theatre natural ventilation systems. From 2012 - 2016 Steve worked in a freelance capacity as a Health and Safety and Environmental Consultant, advising a variety of arts organisations in a range of matters from best Health and Safety practice to energy reduction. Steve is a keen eco self-builder and enjoys touring Scotland’s Highlands and Islands in his campervan. Retired West End Chief Electrician and bike enthusiast, our much loved and most senior rider, taking part for the fifth time. Looking forward to my eighth First Night Ride. Help raise money for people in the industry who need a bit of support; it’s hard enough at the best of times and when things go wrong it’s good to know there’s financial help.